ILSR’s fact sheet is a reliable quick reference guide for policymakers and citizens. As discussion about the telecommunications landscape expands, language about broadband abounds. 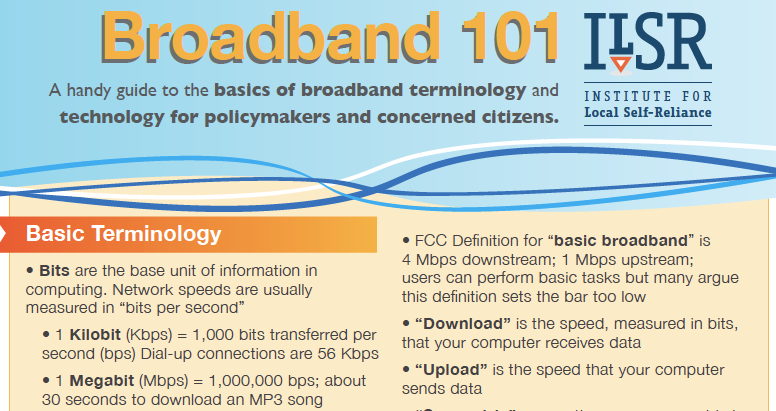 In order to make informed decisions without stumbling over terminology, ILSR has assembled some basic facts about broadband. This fact sheet is a great reference for anyone who may take up the topic of telecommunications but is not familiar with technical aspects. Download a PDF of this enlightening and straightforward resource. Without understanding basics, it is difficult to make informed decisions. This fact sheet is quickly navigated, accessible to a range of users, and filled with relevant information.